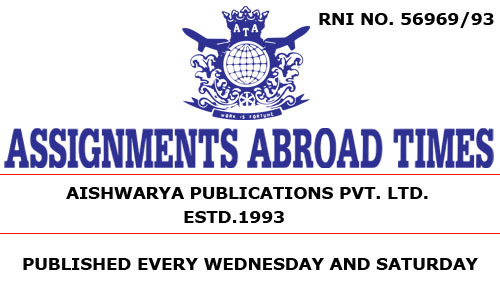 Assignments Abroad Times is a bi-weekly newspaper owned by Aishwarya Publications Private Limited. When we collect your information we may share it across our group companies. We gather information that relates to, and can identify you (e.g. your name and address) and information that does not identify you (e.g. a visitor’s behaviour patterns when they visit our website). We collect information that does not identify you to evaluate our site, ensure that our site and services run properly and ensure we are paid for advertising services we offer. We might also collect your IP address through the placement of cookies (see sections 6 and 7 on cookies and their management, below). The readers belonging to different class, ranging from semi-skilled to skilled to professionals, look forward to each issue of Assignments Abroad Times for job opportunities abroad. Directly (e.g. when you buy a subscription, sign up to create a profile, download a mobile device application or you otherwise provide your information when you interact with us). We always explain why and how we might contact you at the point you give your information to us. We also provide the means for you to grant or withhold your permission for us to contact you We do this by using opt-out tick boxes. If the boxes aren’t there, it’s because we will not use your information for any other purpose than that for which you give it (e.g. to administer a subscription). When responding to promotions, offers etc. by postcard, if you do not wish for your details to be used by us to send you promotions and offers, please make this clear by stating "No Offers". If you have signed up to receive marketing from us by text, to stop this, please reply STOP to the last message you received. If you have subscribed to any of or services, we will use the information you provide to keep you updated on those services unless you have told us otherwise. You have the right to access the personal information held about you. To obtain a copy of the personal information we hold about you, please send an email to applimited@gmail.com . There will be an administrative charge of INR 1000/- for providing a copy of this information. Service cookies that help us to make our website work as efficiently as possible; remember your registration and login details; remember your settings preferences; and meter the number of pages you view for the purpose of administering subscriptions to The Telegraph. User agrees not to seek any injunctive relief nor claim any damages from assignmentsabroadtimes.com Subject to exclusive jurisdiction of courts at Mumbai, India. The assignmentsaboradtimes.com site contains links to other websites but assignmentsabroadtimes.com is not responsible for the privacy practices or the content of such websites. We invest in high-quality security and do our utmost to protect user privacy. No data transmission over the Internet can be entirely secure, and therefore we cannot guarantee the security of your personal information and/or use of the website. Any information that you send is at your own risk and may be read by others. However once we have received your personal information we use strict procedures to protect the security of your personal information. We sometimes share your personal information with third parties who are our subcontractors or providers of various products and services on our behalf e.g. the providers of the services available on our “Offers” page: http://www. All information gathered on our websites is securely stored within the database controlled by us. If you believe that we have not adhered to this Policy, please notify us by email at applimited@gmail.com and we will try to solve the problem promptly..
You may also send a letter to the following address requesting access to or correction of your personally identifiable information. For verification purposes please include your first name, last name, e-mail address and the password you use for said service.